RejuveRX MedSpa provides non-surgical facial rejuvenation injections including Botox and Dermal Fillers, chemical peels, microdermabrasion, facial treatments, and Fraxel skin laser resurfacing. RejuveRX offers a variety of Acne Treatments proven to treat acne outbreaks, restore skin health, and remove acne scars. Acne can leave lifelong imprints on a person’s face, which often are a detriment to his or her self image. RejuveRx offers new technologies to treat and prevent acne and remove acne scars. After a consultation with our medical staff at RejuveRX, a unique protocol will be customized to the patient’s specific needs and conditions. Cosmetic procedures such as Botox and Fillers can improve the appearance of the area around the eyes and face, which is affected by the aging process. Regular treatment regimen can help to maintain a youthful appearance. BOTOX Cosmetic is commonly used to reduce or eliminate the appearance of facial wrinkles. It is injected under the skin into areas surrounding the eyes and forehead. Made from purified protein, BOTOX injections block nerve impulses, weakening muscles to relax wrinkles and give the face a rejuvenated look. Fillers are used for the correction of moderate to severe facial wrinkles and folds, such as nasolabial folds (parenthesis around the mouth). Over time we lose our natural hydrating substance called hyaluronic acid that gives volume to our face and lips. Botox is commonly used to eliminate the appearance of facial wrinkles. It is an injection under the skin into areas surrounding the eyes and forehead. Over the years, many people start to notice fine lines around their forehead, eyebrows, and eyes, caused by squinting, smiling, frowning, and many other unavoidable activities. Non-surgical facial rejuvenation with BOTOX can correct these fine lines. BOTOX is not plastic surgery. It is a quick and temporary way to smooth those lines and look fresher and younger. Restylane® is a clear gel formulation of hyaluronic acid that is specifically formulated to act like your body's own naturally produced hyaluronic acid, helping to visibly correct moderate to severe facial wrinkles and folds, including the lines that run from your nose toward the corners of your mouth (nasolabial folds) and the lines that run from the corners of your mouth toward the chin (marionette lines - lines that run from the corners of the mouth vertically downwards towards the chin). Restylane can be used to add volume and fullness to the skin to correct moderate to severe facial wrinkles and folds, such as the lines from your nose to the corners of your mouth (nasolabial folds). Restylane may also be used for lip enhancement in patients over 21 years. Restylane Silk - The lips and the lines around the mouth, like other areas of the face, show signs of aging as you get older. This often results in lip thinning, lost shape and an increase in vertical lines above the lip. Restylane Silk is designed specifically to provide natural-looking results in these particular areas by using smaller, smoother hyaluronic acid particles than those used in other Restylane®products. 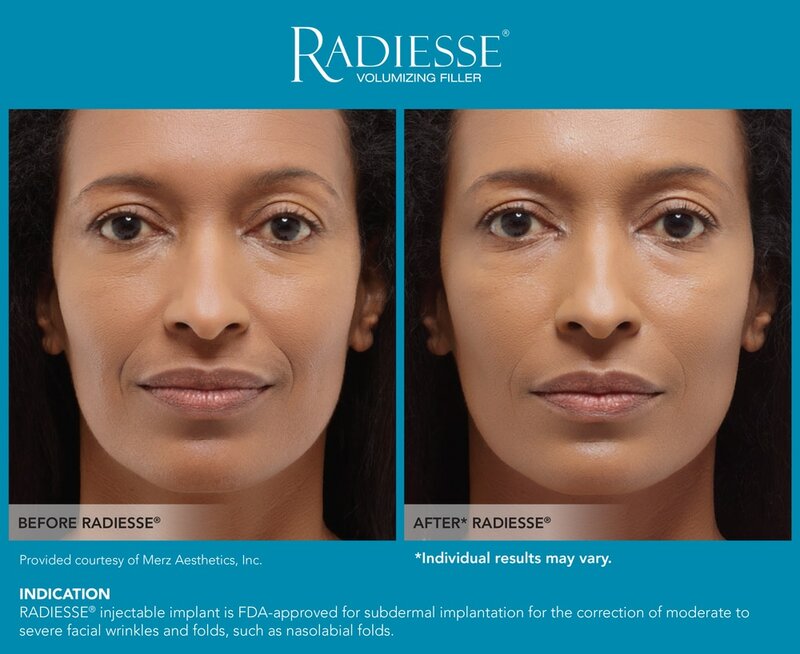 Radiesse are dermal fillers that are FDA-approved to smooth moderate-to-severe facial wrinkles and folds, such as nasolabial folds (the creases that extend from the corner of your nose to the corner of your mouth). Radiesse is also used to correct volume loss in the back of the hands. Radiesse is a wrinkle filler used to plump the skin. Radiesse is injected through a small needle and placed under the skin. Immediately, this filler works to add volume under the skin and over time, the benefits of Radiesse continue by stimulating your body’s own natural collagen. The natural results have been shown to last a year or more in many patients, making the treatment results both immediate and long lasting. Fraxel laser treatment targets aging and sun-damaged skin with microscopic laser columns that penetrate deep into your skin to expedite your body’s remodeling of collagen. And since the laser treats only a fraction of tissue at a time, it leaves the surrounding tissue intact, which promotes very rapid healing. Fraxel treatment resurfaces your skin by stimulating the growth of new, healthy skin cells from the inside out. Belotero balance is a prescription injection that is approved to temporarily smooth out and fill in moderate to- severe nasolabial folds (the folds or wrinkles that go from the side of the nose to the corner of the mouth). The benefits of Belotero Balance® are clear to see in these unretouched photos of actual patients. After treatment with Belotero Balance, moderate-to-severe etched in-lines and wrinkles around the mouth are noticeably smoother with a natural look and feel. 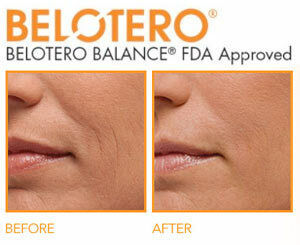 Belotero Balance creates an elegant finishing touch to your appearance, filling small gaps beneath the skin’s surface and improving the appearance of stubborn etched-in smile lines and vertical lip lines above and around the lips.